Managed print services should be more than just about keeping the toner flowing. It’s an opportunity to make your business smarter, greener and more secure as part of a broader IT strategy. In fact, we think it’s essential because your printers, copiers and other imaging devices are now smart devices with processors, memory, hard drives and proprietary operating systems and applications. You should be taking advantage of their document management features to improve your workflow. In the process, you’ll become a more sustainable business. Most importantly, however, is that these devices store sensitive business information that needs to be secure. 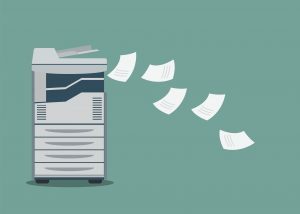 Document management and workflow: By digitizing and streamlining paper-intensive business processes, you can increase operational effectiveness and boost business results because you’re able to minimize human error and simplify information access. Security: Complete visibility and control of your imaging fleet means complete control of your sensitive data too. You can eliminate storage of data on the device and secure transmission of data to all devices, as well as control who can print what and where. Sustainability: Visibility and control enables organizations to reduce paper use, pollution from toner and petroleum products, and the use of earth metals and plastic. As with any managed IT service, you can take the pressure off your own people and let them focus on more strategic projects, while at the same time streamlining your costs by eliminating the upfront expenditures equipment and supplies and paying on a cost-per-impression basis. Because it is aligned with a larger IT services organization, PrinterLogix can build the right managed print services architecture at your site. Our MPS360 service includes everything you’d expect from a standard managed print services offering enhanced with a “white glove,” pay-as-you-go approach and advanced document management features. Since you no longer need to manage hardware and software, MPS360 cuts transition and upgrade costs. You only pay per impression with an SLA that reflects your specific business requirements with predictable costs, while become smarter, greener and more secure.